. 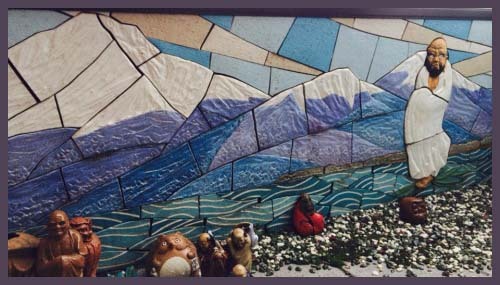 Kappa tairu 河童のタイル Kappa tile . Bizen ware is unglazed stoneware made in Okayama Prefecture around the town of Bizen and has a long tradition from the late Kamakura Period until now. The firing takes place at high temperatures with red pine wood (akamatsu 赤松) and gives the pieces a natural wild appearance, with red-glaze streaks, charcoal-like patches or iridiscent blue-green patterns. Most pieces are storage vessels, mortars, vases and ricewine bottles. The local earth around the town of Bizen has special properties to conserve food and keep it fresh, so in pre-refrigerator times huge jars were used to keep tea leaves, soysauce or miso paste. Especially the transport of perishable goods from the provinces to the Shoogun in Edo was done using quite large Bizen vessels. The production of pieces for the tea ceremony started around 1500. 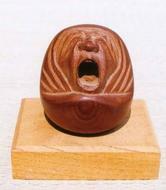 The Azuchi-Momoyama period was the golden age for Bizen ware. Today there are more than 200 potters working in the Bizen tradition, using the special Bizen earth to produce also modern items like beer mugs and teacups for everyday life use. 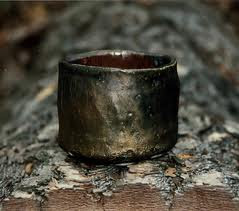 Since no glaze is used for Bizen, you have the pure beauty of Earth, Wood and Flames. I sometimes help my potter friend Mondo Takagaki to fire the huge kiln (noborigama 登り窯) for 10 days and I want to show you a picture of the flames at about 1200 degrees centigrade. The camera is almost melting away if I do not take special care! After 10 days of high tension it takes another 10 days to wait for the kiln to cool down. Then comes the great day - Opening the Kiln (kamadashi 窯だし). 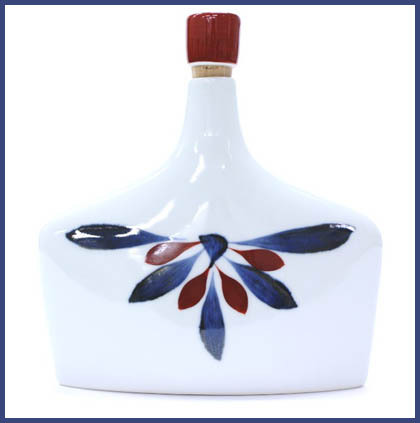 You never know what happened inside during the firing and each piece is a unique work of art with unique patterns. By the way, I live only about one hour away from the town of Bizen. Bizen Pottery traces its long history back to Sueki Pottery (earthenware fired with no glaze) in the Tumulus Period. From the Heian Period to the early Kamakura Period, potters started to produce more practical and durable wares for everyday use. This is believed to be the beginning of Bizen Pottery. Bizen Pottery is one of the six famous ancient medieval pottery styles in Japan, including Seto, Tokoname, Tamba, Shigaraki and Echizen. 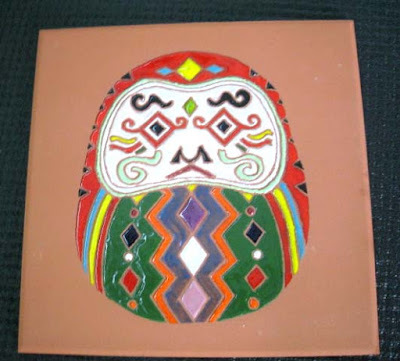 It is also known as "Imbe Pottery" based on the name of the area. 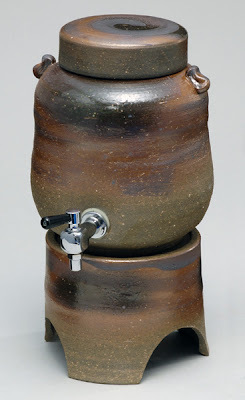 Bizen Pottery traces its long history back to Sueki Pottery (earthenware fired with no glaze) in the Tumulus Period. From the Heian Period to the early Kamakura Period, potters started to produce more practical and durable wares for everyday use. This is believed to be the beginning of Bizen Pottery. 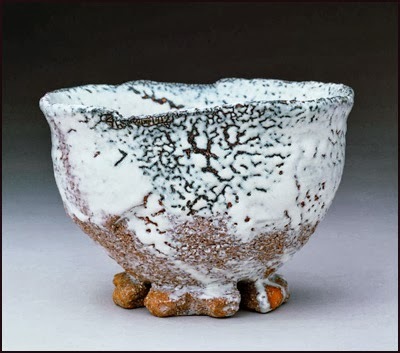 The beauty of Bizen Pottery is in its unadorned simplicity. Its unglazed austere appearance caught the attention and admiration of tea ceremony masters in Sakai and Kyoto. 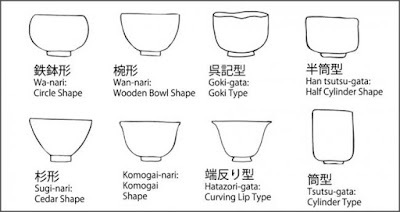 In the Momoyama Period, a number of masterpiece tea bowls were created. 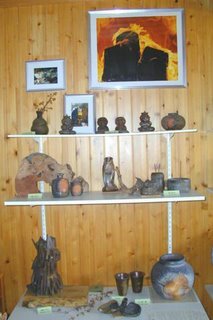 Here is a store where you can have Bizen Pottery send to abroad. English HP. 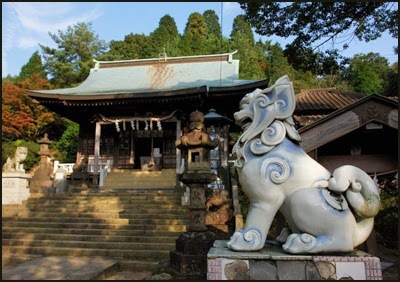 The Shizutani School was built in 1670 and is cosidered to be one of the most impressive contributions made by Okayama's Edo Period ruler - Lord Ikeda. Nestled in a peaceful vale northeast of Bizen City, the school was the first institution open to all regardless of social rank or class. The school is enclosed by a superbly crafted stone wall and boasts reddish-brown Bizen-ware roof tiles and stark white walls, contrasting spledidly with the natural beauty of the surrounding area. Now some Darumas from my collection. This one is seated and looks a little unhappy. He is 17 cm high. His flywhisk hangs over the left shoulder and is eyes are wide open. 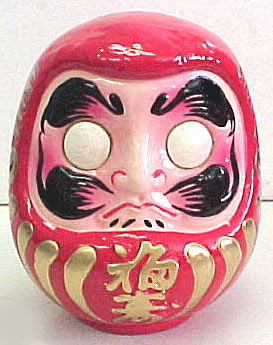 Next we have a small standing Daruma, one of the more classical types. He is 17 cm high. He is made from a form, so he has many identical brothers. This rather voluminous one is seated, the hand on his knee. He is 17 cm high and his facial expression and the beard are wonderfully formed. 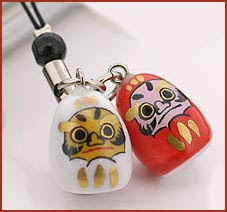 Finally a Daruma with a hat hanging on his back. This is quite a uniqu rendering. He is 27 cm high. This is quite a unique rendering. .
a friend came along yesterday and brought me another little Bizen Daruma of only 3 cm hight, with a little hole in the back as an incense stick holder. 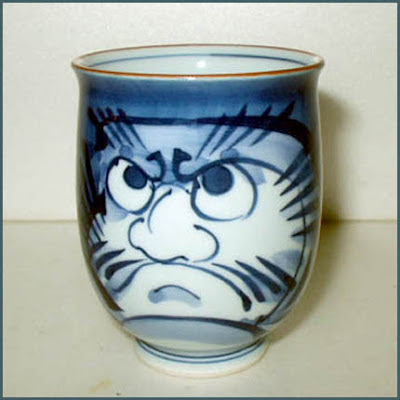 Arita porcelain is the oldest porcelain in Japan. The Korean potter, Ri Sampei (Yi Sam-p'young 李参平; 1579-1655), is credited with discovering porcelain clay in the Arita area of Kyushu, making it possible to reproduce the fine Ming porcelains of China. 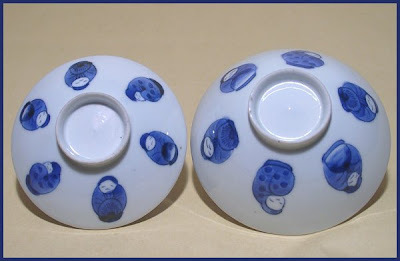 A healthy export industry in blue and white and polychrome porcelains for the European market was subsequently developed through the Dutch East India Company and the tutelage of the Nabeshima Clan. Kutani ware polychrome porcelains, distinguished by the use of rich green, yellow and red pigments, were a popular product of the Kaga domain (now Ishikawa Prefecture), rivaling the Arita kilns of Kyushu. in historical sources, was a Japanese potter who is said to have moved from Korea. 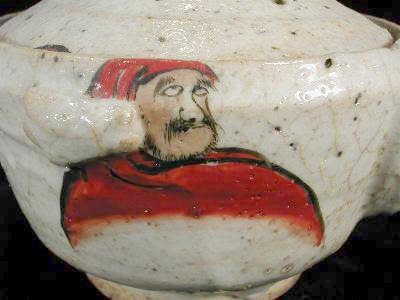 He is often considered the father of Imari porcelain (Arita porcelain) although the narrative is today questioned by historians. 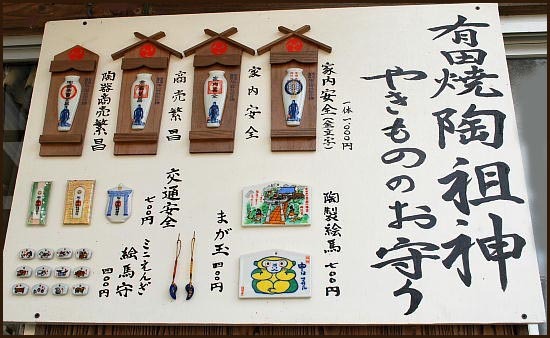 He is honored in Sueyama Shrine of Arita as the father of Arita porcelain. 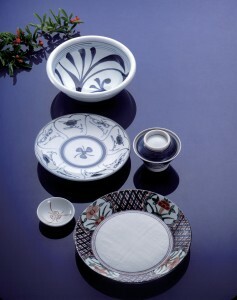 Arita porcelain is roughly classified into the following three groups. 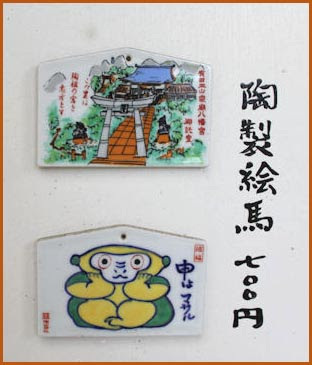 1-The first is called "Old Imari (Ko-Imari古伊万里)". During feudal times Arita porcelain was loaded on ships at Imari Port, which was more than l0 kilometers distant from Arita. It has remarkable characteristics. 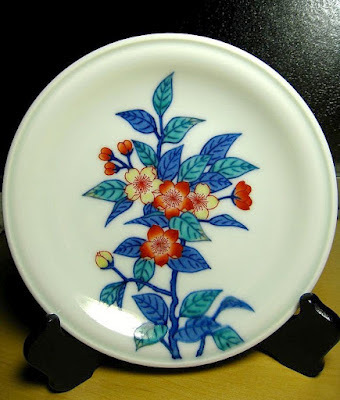 Most of the pieces of Ko-Imari are decorated with picture patterns on the entire surface. Gold and silver are used generously. Dragons, chrysanthemums, peonies, pine trees, bamboo and plum blossoms are often seen in brilliant and dazzling patterns. In this group we find the influence of China, the baroque and rococo fine arts of Europe and the fully matured culture of the Japanese people at that time. 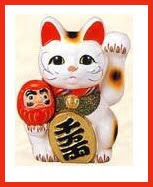 2-The second group is called "Kakiemon　柿右衛門". The picture patterns on the milk-white background color are intentionally unbalanced on the right and left. 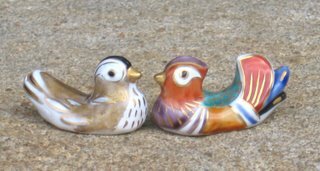 In old times these designs were so popular in Europe that copies were baked at the Meissen Kiln. The family of potter Sakaida Kakiemon now goes into the 14th generation. "Fourteenth Red" was even the subject of a book explaining the tradition of this famous Arita kiln. 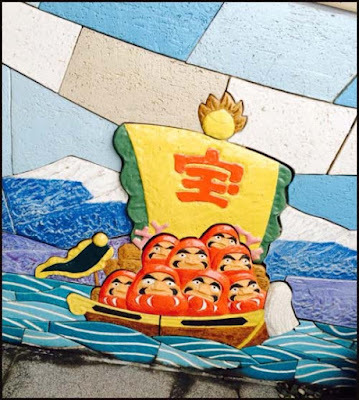 3-The third group is called "Iro-Nabeshima 色鍋島". 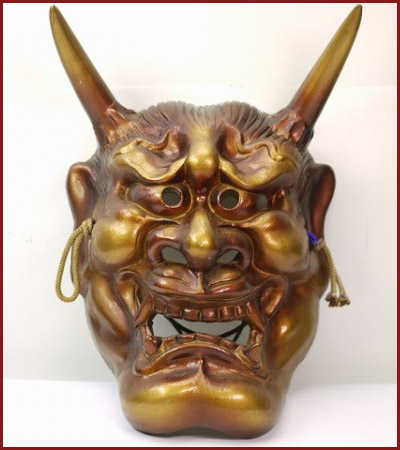 The products of this group were only for presentation to Emperors, Shoguns and feudal lords as well as for daily used by Lord Nabeshima and his family, rulers of this area. Commoners were barred from access to "Iro-Nabeshima". After the collapse of feudalism, however, it became available to anyone. 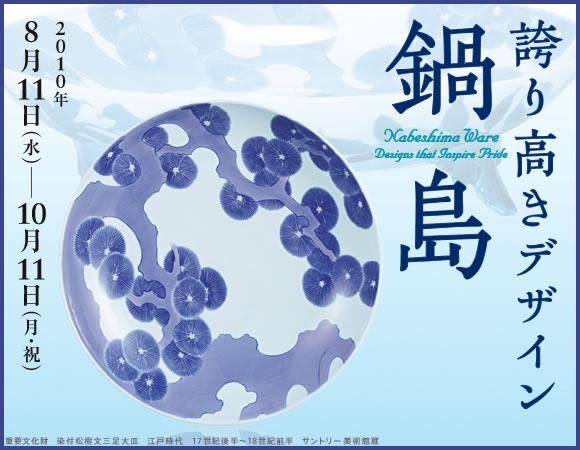 It still retains its noble elegance for which it has been noted for centuries.
. 平成鍋島　大皿 - Heisei Nabeshima - large plate . 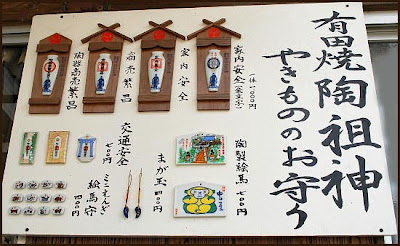 In Arita there is also a shrine for the God of Pottery. Toozan Jinja 陶山神社 Tozan Jinja, "Pottery Mountain Shrine"
To suit the modern home environment, Satoru Matsumoto (7th generation proprietor of the historic Yazaemon Kiln) envisioned a chic, more durable collection of Arita-yaki porcelain with cool color combinations. Its matte white porcelain is 1.5 times more dense than usual, while the auspicious flora and fauna motifs are given a fresh feel with the addition of genuine platinum. Maintaining the high quality of the kiln’s heritage, the ‘Japan Snow’ hors d’oeuvre box evokes a sense of cool elegance with its stylish modern appeal. 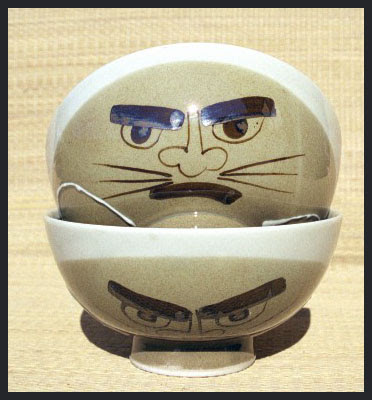 Arita ware with our Daruma san. 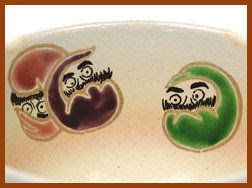 Arita is known for its mass-produced tableware and we find a lot of them with Daruma san as a decorative pattern, ranging from a real face to quite an abstract rendering. 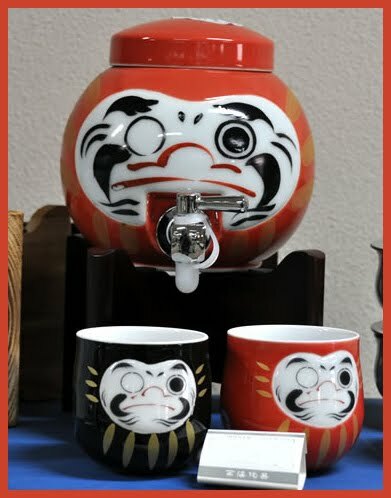 A big teacup with Daruma looking at you. without bending the neck too much. The Nabeshima kiln 鍋島焼, run by the Nabeshima family for Kyushu's Saga Clan, was Japan's preeminent kiln in the service of a feudal domain, producing ceramic work for more than 200 years during the Edo period. 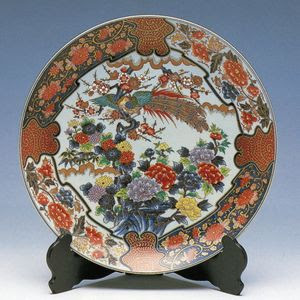 Its high quality tableware, which was presented as gifts to the Tokugawa Shogunate household and to feudal lords, consisted primarily of blue-on-white underglaze porcelains, stylish overglaze polychrome enamels, and Celadon ware; these still charm viewers today with their elegant, attractive designs.The pieces produced, whilst continually striving for novel designs, always retained the sense of nobility and clarity associated with Nabeshima. A small teapot to make one or two cups of green tea. It usually has a handle on one side. They come in many colors and patterns. Some are even as big as to make 12 cups. Sometimes a kyusu without a handle is called like this. Approx　3", 76mm High 3.7", 94mm in Diameter. 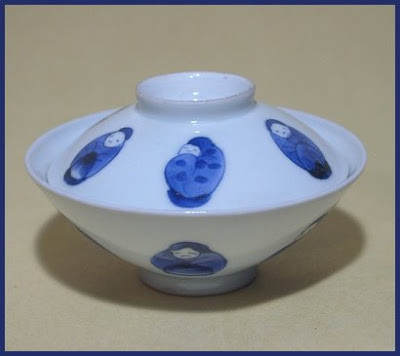 It is about 9 cm high and has a diameter of 12 cm.
. Water kettel 鉄瓶 tetsubin . Tokoname is one of the six old kilns of Japan. It is now famous for its tea pots and bonsai pots. 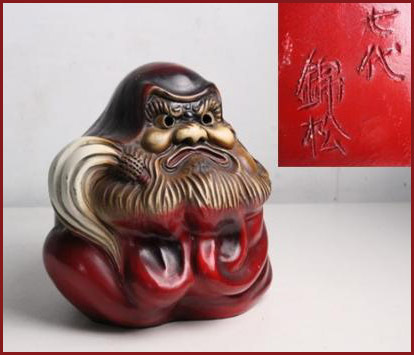 This is Daruma as a piggy bank from Tokoname clay. He comes in various sizes. 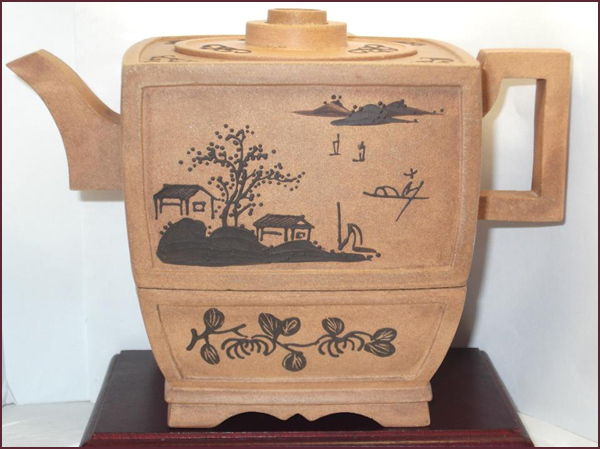 The pottery made on the Chita Peninsula, especially in Tokoname City in Aichi Prefecture, is known as Tokoname-yaki. Kilns have been at work here for about 900 years, and in the pottery region of the Chita Peninsula remains of 1,200 ancient kilns, outnumbering those found in any other part of the country. Production peaked during the 12th and 13th centuries, at which time an estimated 3,000 kilns were built, and Tokoname-yaki was shipped throughout Japan. 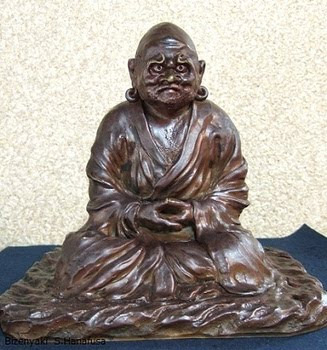 Initially, the products were religious items such as jars for storing Buddhist sutra scrolls. 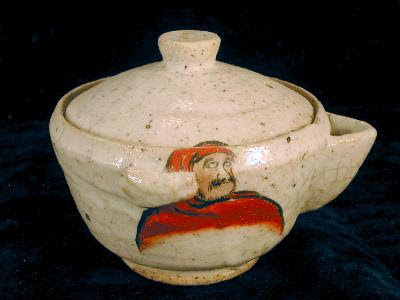 In the 14th and 15th century production shifted towards items for household use including pots and large storage vessels. 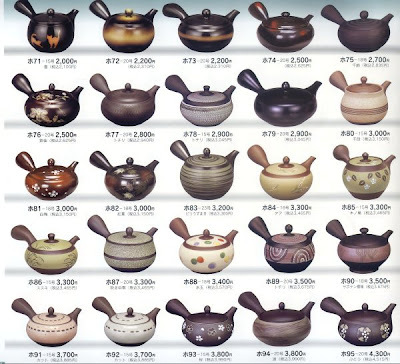 In the 18th century evolution towards the current style of Tokoname-yaki began with the creative input of artisans. 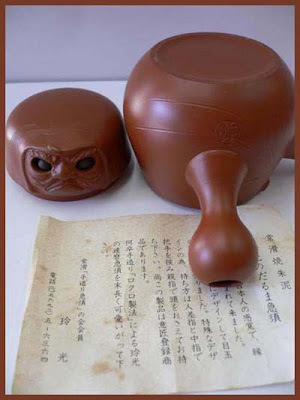 Then, in the 19th century, the red clay teapot, the best known of all Tokoname-yaki items, was created. 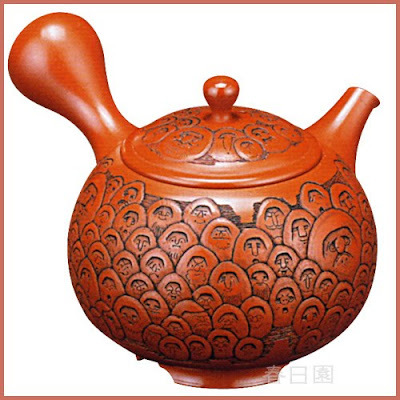 The iron-rich clay comes out an attractive brownish red color after being kilned. 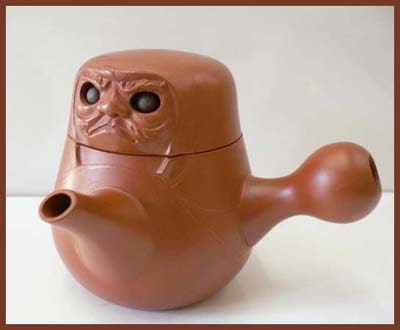 These days the pots are mass-produced and used daily in many ordinary households. In the 20th century, demand has changed with the modernization of society and new types of items have been produced. 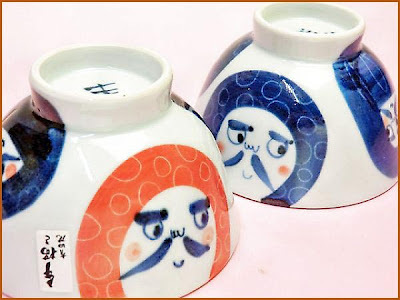 In addition to the red teapots, tea cups, tableware, flower vases, and ornaments, the production of ceramic pipes, tiles, sanitary ware, and flower pots has been on the increase, and a great variety of products are now being manufactured in Tokoname. 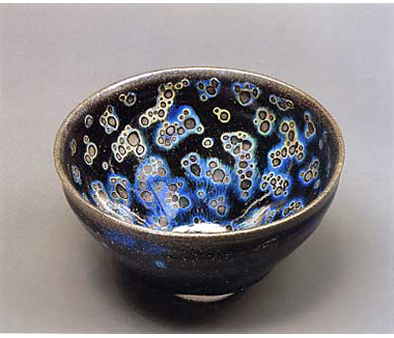 Tokoname is a high-fired ash-glazed ware made in Aichi Prefecture (in the region formerly known as Sanage). Originated sometime in the 9th century. 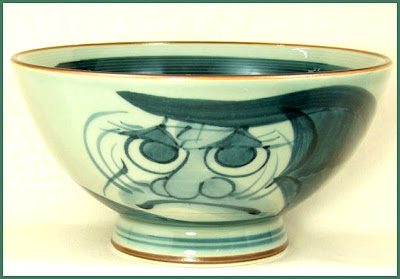 "chawan", meaning "bowl for TEA". 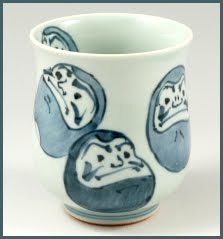 a teacup, YUNOMI, is "Drinking Hot Water".
. Aritayaki 有田焼 Daruma of Arita Pottery . A chawan (茶碗) is a bowl used for preparing and drinking matcha (powdered green tea) in Japanese tea ceremonies. 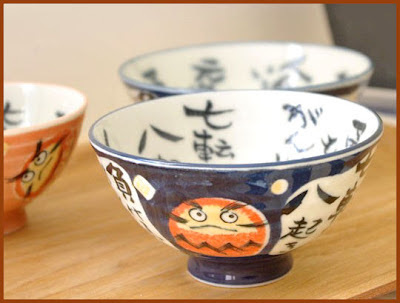 In Japan, "chawan" also is the standard term for bowls for rice. If it is necessary to distinguish between them, bowls for rice are called gohan chawan (usually pronounced gohan-jawan), while the ones for use in chanoyu are called matcha chawan (matcha-jawan). 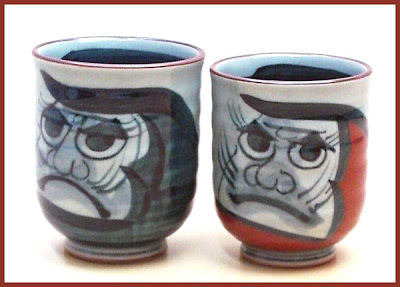 The handle-less cups used for drinking regular course steeped tea are generally referred to as yunomi (lit., cups for hot water), while the small porcelain cups used for fine-quality steeped green tea are often distinguished as senchawan. 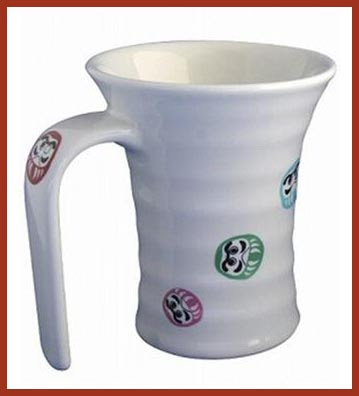 When the word chawan stands alone, it is normally prefixed with the honorific o-. 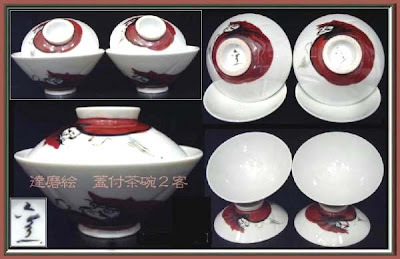 There are many types of chawan used in the tea ceremony, and the choice of their use depends upon many considerations. In the world of Japanese traditional ceramics there is not one form held in higher esteem then a chawan, a “mere” bowl used to serve whipped green tea. For more than 400 years this celebrated clay form has challenged potters to create a perfect vessel of segmented harmony to “simply” enjoy a cup of tea. Yet there is much more than meets the eye when we begin to look at chawan and the subtle nuances they embody, the spirit they reveal, and the so-called “hand-held universe” as they are poetically referred to. 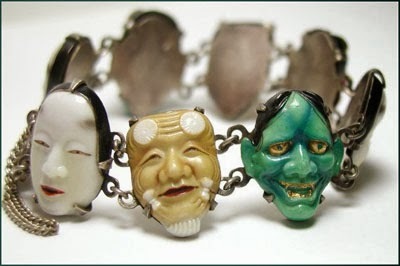 The masterpieces from Japan were made in the Momoyama and Edo periods (1573-1867) and again in a Momoyama-style revival of sorts beginning in the 1930s. 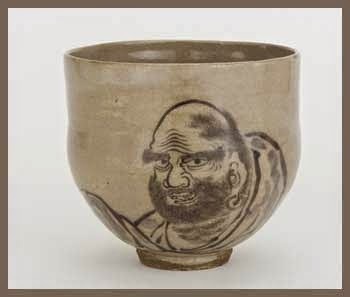 It’s from this latter period to the present that the current “Master Teabowls of Our Days” exhibition at the Musée Tomo Museum focuses on, and it starts with the greats of the day. Now this may all sound very easy, yet many potters have told me making a good chawan is the hardest thing in the world for them. Why? 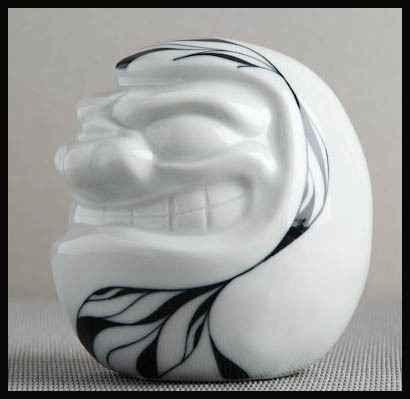 It’s the giving birth to the essence of materials and hopefully allowing technique to be forgotten, so that forming becomes like breathing, while spirit shines; only then will a chawan come to life. The ones on display at the Musee sing that song of “life.” Interestingly enough, the chawan chosen for the cover of the catalog was made by a self-confessed amateur, Handeishi Kawakita (1878-1963). 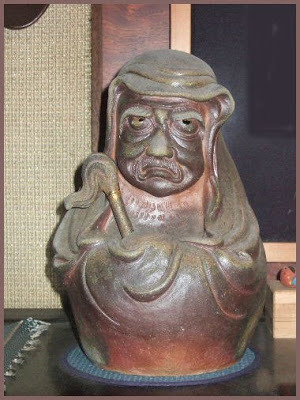 Kawakita was not a potter by trade; he came from a wealthy banking family based in Tsu, Mie Prefecture. At the age of 56 he left behind the corporate world and built a climbing chamber kiln on his extensive property. Thus began his life as a potter.
. Hattori Ransetsu 服部嵐雪 . Sakuo Nakamura believes that the flowers are reflected in the tea. He writes, "A teacup is put on the morning breakfast table. On the surface of the tea, morning-glories are mirrored. Issa has succeeded in catching the large morning atmosphere in a little teacup." This early autumn hokku is from the 7th month (August) of 1821, when Issa was in his hometown taking care of his wife Kiku, who had come down with a severe case of gout. 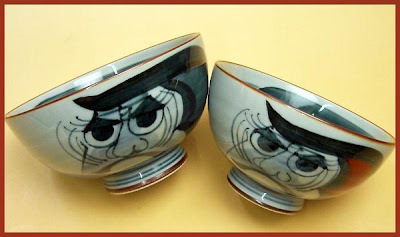 In Issa's time people drank green tea mostly in bowls that were the same size as rice bowls and tea ceremony bowls that were often in strikingly artistic shapes. 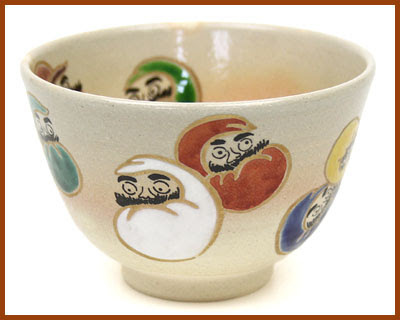 Most commoners, however, used the same kind of bowl to drink tea and to eat rice and certain other foods. 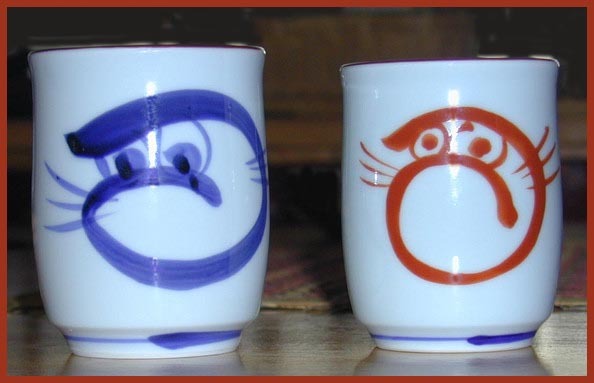 The small cups commonly used to drink green tea in contemporary Japan are basically the cylindrical cups (yunomi) that were originally for drinking warm water and also green tea in Issa's time. In his time the wider tea bowls were used not only for drinking green tea but sometimes for drinking sake, water, and other liquids. 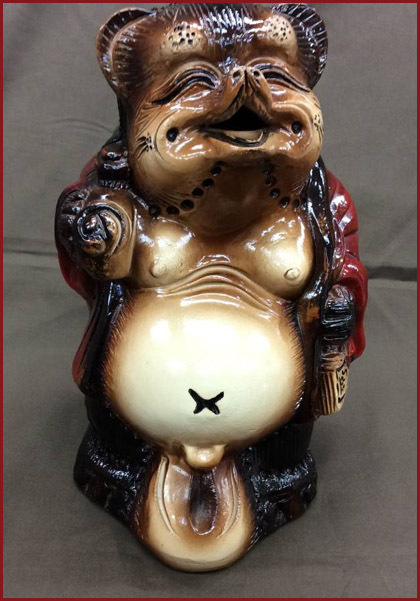 This hokku can be interpreted in various ways, but I take it to be about a tea bowl that has been filled with water, upon which several morning glories have been floated. It was common to float various kinds of flowers or flower petals in bowls of sake or water, though water seems more likely here. Perhaps Issa puts the bowl by the mat on which his sick wife is lying, or perhaps on a tray or low table nearby.
. Teacups 湯のみ yunomi "drinking hot water" . memorial service for Chinese rice bowls . "Little srping" refers to a spring-like week or two in early winter, similar to North American "Indian summer". The word here translated as "teabowl" ('tenmoku') literally means "sky-eye", which could be taken as the eye of Heaven, or the eye looking at the sky. 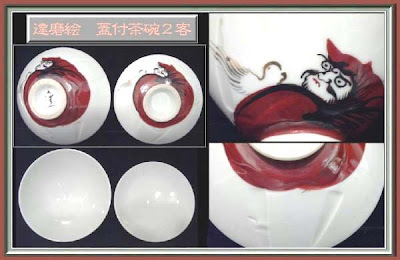 It refers to one of the more valuable types of bowls used in the tea ceremony ('cha no yu'). The poem suggests that the tea master's bowl catches the season itself, a high compliment.